You frown at what you're wearing when you look at yourself in the mirror each morning, but you can't bring yourself to shop for new clothes because you hate spending tons of money on clothes that don't fit you or your style. You sigh in exasperation as you leave a thrift store with nothing in hand after an hour of browsing the racks. You don't know what to search or even what looks best on you. You're depressed because you resell thrifted items for a profit, but no one is buying. You long for a way to find more hot items to sell so you can increase your profits. 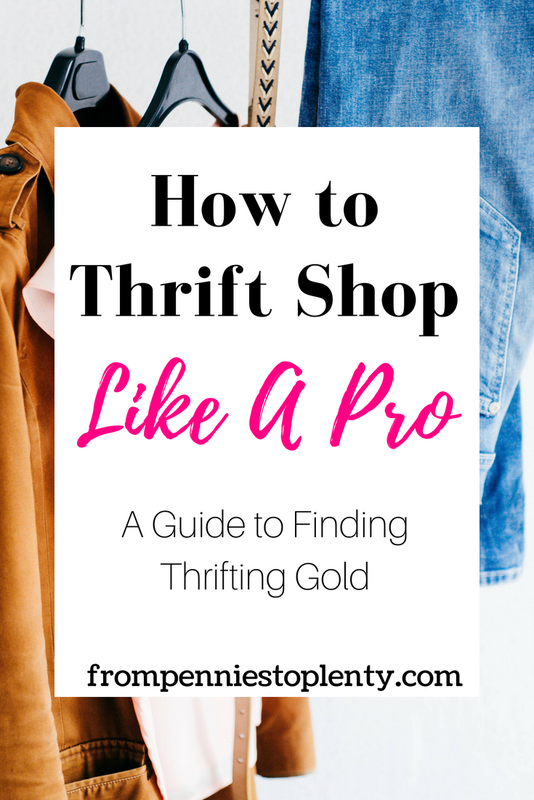 How to Thrift Shop Like a Pro: A Guide to Finding Thrifting Gold is your guide to tackling the thrift store and finally seeing the results you want from thrift shopping. Walking confidently down thrift store aisles, sifting quickly through the racks, and spotting armfuls of fashionable clothing. Opening up your closet in the morning excited about choosing what to wear because you've grown your wardrobe to fit your style without going over your budget. Smiling as you check your bank balance and realize how much you've saved because you're spending hundreds or even thousands of dollars less on clothing now. Excitedly stocking your online store with even more on-trend items. Because more hot items means more sales and more profit, right? in How to Thrift Shop Like a Pro, you'll learn everything you need to know to make the most of each trip to the thrift store. What will you learn? How to quickly spot fashionable clothing to maximize your shopping time and effort. Where to shop and how to navigate stores to find the best goods. How to save your money by spotting and avoiding counterfeit goods. Tips to clean your thrifting finds so they’re ready to wear or sell. What to do when you don’t have a personal style. Next steps for what to do when you find more good things than you can wear. Be the stylish fashionista you've always dreamed of being without spending your whole paycheck on it. Transform your wardrobe into the one you want with on-trend clothes at low prices. Take charge of your thrift shopping experience. The thrift store will no longer be some foreign, intimidating place. You'll walk into stores knowing what you want and where to look for it. Turn your hours of fruitless shopping into successful ones. Quickly cover whole stores in a matter of minutes or a few hours and leave with bags of clothes you can't wait to wear. Turn your small online reselling business into a money-making machine. Source more and better clothes from the thrift store to sell for profit. You're looking specifically for sales strategies to make sales on sites like eBay and Poshmark. This book focuses on getting the best finds at the thrift store and what to do with them afterwards (e.g., cleaning your items). You're looking for a list of top brands to sell for profit. That list is already available to you for free at From Pennies to Plenty! You've been thrift shopping since you started walking and already know every tip there is about it. You're not interested in putting in the time and getting your hands a little dirty to shop at thrift stores. Examples of my thrifting finds. Take a look at some of the brand-name items I've found while thrift shopping. These are not miracle finds. They await you too. Printables to help you sort your closet and determine what you want to buy. Be prepared for your next shopping trip. You're a knowledgable and determined shopper now. Hi thrifting friend! 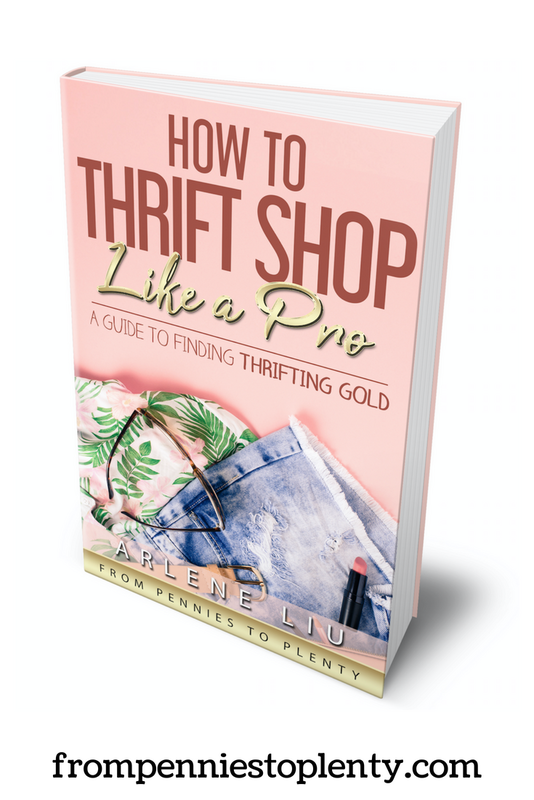 I'm Arlene, thrift shopping addict, online reseller, and creator of the blog From Pennies to Plenty. My closet is packed with name brand dresses, stylish athletic wear, and cute casual clothes. Guess what? While it looks like I spent a ton on my clothes, I did it without spending much at all by shopping at thrift stores. In the process, I've saved tons of money that I've put towards other things like savings and travel. I’ve also earned thousands of dollars selling my excess thrift finds. Now I want to share my knowledge and finds with you so you can do the same. I don't know how to thrift shop. Will this help? How to Thrift Shop Like a Pro is perfect for you! The book includes how to get started thrifting including navigating stores and what to look for on your first few visits. You'll find tons of tips for getting the best finds, but you don't have to implement them all at once. The printables (a wardrobe essentials list and a be-on-the-lookout page) are meant for the beginning thrift shopper. Can't I find this information somewhere else? Maybe, maybe not. How many extra hours do you have in your day to research and piece together tip after tip? How many thrift shoppers do you know out there are telling you ALL their tips to get the best finds? Thrift shoppers may tell you some things they know but not everything because they don't want to give all their secrets away. I've held nothing back in making this guide. All my knowledge is now your knowledge. And everything in the guide is based on my thrifting and selling experience. Why are you sharing all this information? I started From Pennies to Plenty to share my thoughts and tips on how to save money. This book is an extension of that desire. Since I started writing about thrifting, I've received so many questions and comments from people about how to improve their thrift shopping and sales. I decided to focus on the experience of thrift shopping itself in this book. I remember being a new thrifter and trying to learn as much as I could about it. Save yourself time and some of my shopping mistakes by learning about thrifting with this guide. Is $15 a good deal? Yes, it is! Think about how much money you will save by becoming knowledgable about thrift shopping. You can easily save $15 or more with just one thrift store find. One of my most recent thrift finds is a beautiful Eliza J dress that I think is brand new. It last retailed for $131 (probably on sale) and I bought it for $12.50! I saved $118.50 right there on that one dress. That's not a rare occurrence either. And guess what? I'm selling it for only $15 because I want you to have it. I'm positive you will find over $15 of savings at the thrift store just by implementing the tips you find in this guide. Is payment easy and safe? Yes, From Pennies to Plenty and it's associated shop are run by Squarespace. Squarespace accepts credit card payments through Stripe as well as payments via PayPal. The checkout page is protected by SSL to keep customers’ credit card data safe and secure. Checkout pages are Level 1 PCI compliant and use 128 bit SSL encryption. You will see a lock icon in your browser when you check out. After purchasing the book, you'll receive an email with a link to download the book. Once you first click in the link, you have 24 hours download the book before the link expires. Don't worry, I can resend the download link to you if needed. Just email me at arlene@frompenniestoplenty.com. Will I receive a copy of the guide in the mail? No, the guide is provided in digital form only. You will receive an email with a link to download the book once purchased. No physical copy will be sent to you in the postal mail. Refunds are not offered due to the immediate accessibility of the guide. That said, I want all buyers to be happy with their purchase. If you are not satisfied with your purchase, please feel free to contact me. I'd be happy to answer your questions. Send me an email at arlene@frompenniestoplenty.com and I'll get back to you as soon as I can. Thrift stores are full of hot goods waiting to be found by people like you. 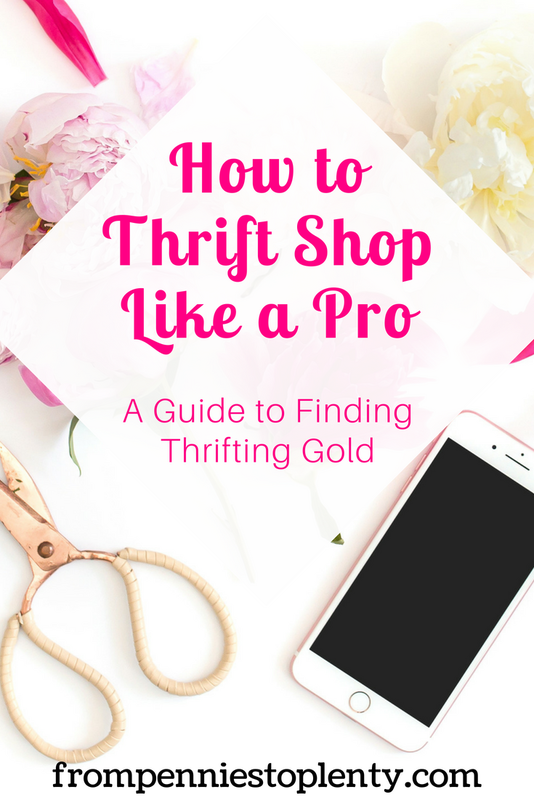 Become an expert thrift shopper now with How to Thrift Shop Like a Pro!